Exploring beauty is what landscape painters do. And when it comes to our home turf, extra bragging rights come with the territory. So many sites in Pensacola have become dear to me as I've painted outside here over the last decade. 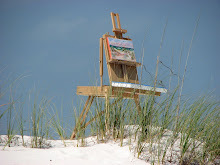 When Visit Pensacola proposed hosting a "Meet the Artist" event at the Visitor Center, I agreed. Opportunities that suddenly arise are the best. I painted the view out the back door, staying inside for the comfort of viewers. 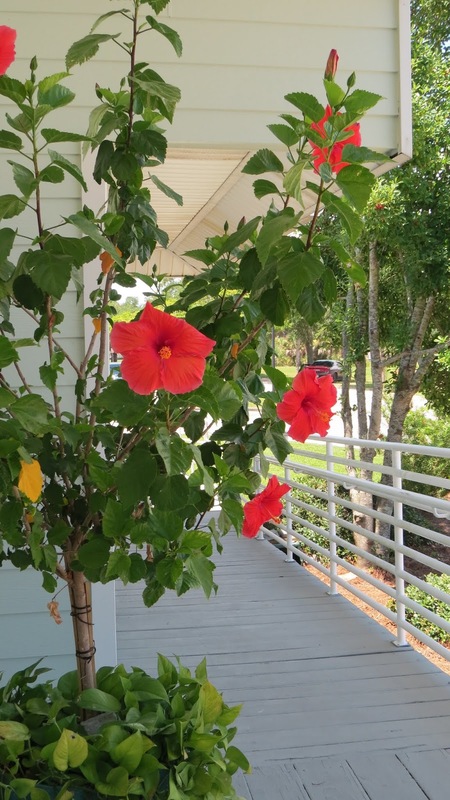 The hibiscus on the porch gave a nice color boost to the foreground. 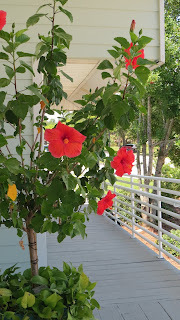 I pause even when painting, to snap a photo of fleeting beauty. My little "pop-up gallery exhibit" featured paintings from all sides of town including Joe Patti's Seafood, Hemingway's at the Beach, Scenic Highway, Navy Point Park, a marina near the Barrancas Bridge, and a Gulf view from the Pensacola Lighthouse. The one on the easel was painted near the visitor center location, Historic Downtown. I call it "Native Vegetation" because that's how I imagine our shore appeared when Luna's fleet arrived in 1559. Three of their vessels have been discovered in Escambia Bay. They were unprepared for hurricane season! We are uniquely situated as a seaport with protective barrier islands. I even find maps of our area fascinating, considering all the bays and bayous as treasure troves. We are short on elevation, no mountains in the distance, but quite rich in shoreline with abundant plant life. We're known as the "World's Whitest Beaches", "Cradle of Naval Aviation", "Western Gate to the Sunshine State", "America's First Settlement", and the "Emerald Coast". Beautiful location...The painting room is also amazing as well as your painting. Way cool! Awesome location.Some very valid points! I appreciate you for sharing!